PALMDALE – You can spread holiday cheer to veterans, military families and active-duty service members this season, with help from the American Red Cross. The American Red Cross Antelope Valley Chapter is hosting a Holiday Mail for Heroes card signing party this Thursday, December 5, from 4 to 7 p.m., at the Red Cross Chapter House, located at 2715 East Ave P in Palmdale. Red Cross volunteers across the United States and on military installations overseas sort and deliver the cards throughout the holiday season. The Red Cross has received and distributed more than 6.5 million cards for members of the U.S. Armed Forces, veterans and their families since the program began in 2006. For Thursday’s local card signing party, attendees can either bring their own holiday cards or create them from scratch at the event. Organizers will provide snacks, drinks, and card-making supplies. 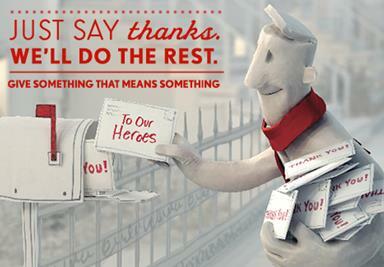 The cards will be distributed to local military personnel and veterans in the weeks to follow. Each year the American Red Cross provides assistance to more than two million service members and many of the country’s 24 million veterans. The organization also supports military families, military and veterans hospitals and provides emergency communications across the globe. The cards and personal messages sent through Holiday Mail for Heroes provide a welcome “touch of home” for troops during the holiday season. For more information on the Holiday Mail for Heroes card signing party, contact the American Red Cross Antelope Valley Chapter at 661-267-0650 or visit http://www.redcross.org/ca/palmdale.